In March, Mary Anne Christo and her husband, Eric Waksmunski, were blessed with twins. It was a difficult pregnancy and doctors determined the babies had to be delivered early. Anticipating the usual complications faced by premature babies, the Mahoning Township family was devastated to learn both of their precious little boys have Down syndrome. The next few months would be filled with countless sleepless nights, hotel stays and hospital vigils. The shock and grief Christo and Waksmunski first experienced is waning and they have accepted that their lives have changed forever. For Christo, the dreams she had for the twins as she awaited their birth are no more. She has learned she can still dream, but they are different dreams now. Their priorities have also changed. What was important in the days before the twins were born — in Waksmunski’s case, the ups and downs of his beloved New York Giants or Mets — is no longer important. Time once spent watching a game is now spent online, where he may be learning more about Down syndrome or researching a recommended medical procedure. After too many nights going to bed, praying their babies would not die as they slept, the couple has learned to take one day at a time. For as traumatic as this experience has been for the family, it has also opened their eyes and given them passage into a new world, a community of parents of children with special needs. It is not a life they would have chosen had they been given a choice, but it is one that has embraced and supported them as they struggled to deal with often frightening and stressful days, filled with life-and-death decisions. 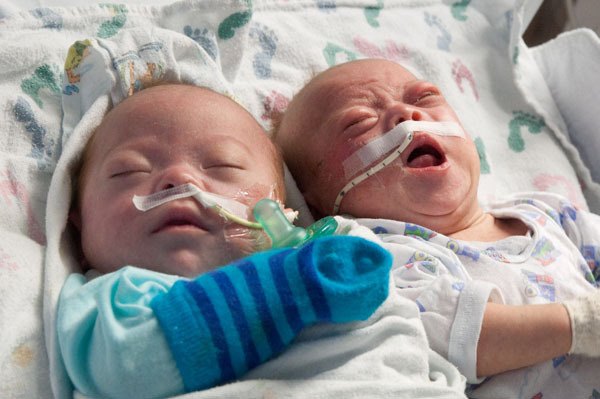 Several weeks after the twins were born, Waksmunski created “Shane and Wyatt’s Journey with Down syndrome,” on the social media network Facebook. While it initially started with family and friends, it quickly grew and has attracted nearly 1,100 supporters from around the world. Many of those who joined have children with Down syndrome or other disabilities. To tell their story, and to reach out to other families who may face a similar experience, the Waksmunskis have agreed to open their home and their lives and share this special journey in an ongoing series in the TIMES NEWS.